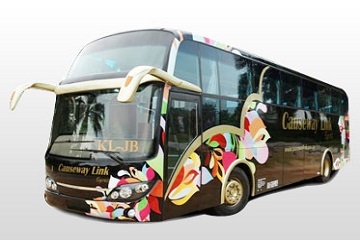 Causeway Link Express is one of the biggest bus companies in Johor Bahru that offers bus services covering major cities and towns in Johor Bahru, Malaysia and Singapore. 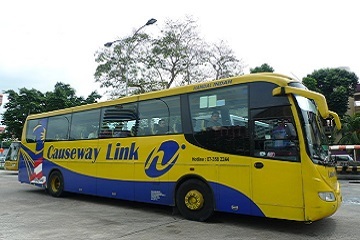 Causeway Link which is also known as Handal Indah also offers media advertising and vehicle chartering besides coach services. 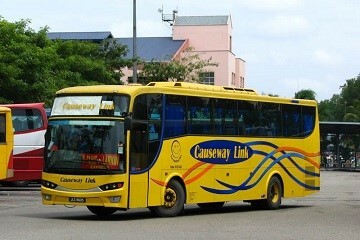 Causeway Link Express operates about 100 bus routes daily in the west region of Peninsular Malaysia and Singapore. It provides bus services depart from Johor Bahru to Terminal Bersepadu Selatan, Batu Pahat, Mersing, Klang, Melaka Sentral, Bukit Bintang and Shah Alam Terminal. The pick-up points at Johor Bahru which offered by Causeway Link Express includes Johor Bahru Larkin Terminal and Batu Pahat. In addition, Causeway Link also provides bus services from Puteri Harbour-Hello Kitty Town, Thomas Town and Legoland to Bukit Bintang Kuala Lumpur. Some other Causeway Link popular routes are from Kuala Lumpur, Malacca and Selangor daily to various location in Malaysia. Not to mention, Causeway Link also offers return ticket from Jurong East Singapore to Terminal Bersepadu Selatan Kuala Lumpur on a daily basis. Causeway Link offers buses in single deck and also double deck. All of the buses are equipped with air-conditioning, ample leg space and comfortable seats. The buses are well designed and manufactured by their own team. Causeway Link Express aims to maintain its reputation as one of the most highly regarded bus operators in Malaysia by providing efficient, reliable and friendly service. Book Causeway Link Express Bus Ticket Now with Easybook. No. 23, Jalan Firma 2, Kawasan Perindustrian Tebrau IV, 81100 Johor Bahru, Johor. G12A, Ground Floor, Menara MDBPB, Jalan Rugayah, 83000 Batu Pahat, Johor. No.1 & 1A, Jalan 15/3, Taman Bukit Indah, 81200 Johor Bahru, Johor. Counter 1, Terminal Bas & Teksi, Melaka Sentral, Peringgit, 75400 Melaka. Counter 25, Terminal Bas & Teksi, No 25, Jalan Jejulung, 17/21 Seksyen 17, Shah Alam. Counter 26, Klang Sentral Terminal A, Express Terminal Persiaran Klang Sentral, Klang Sentral Raja Merai, 41050 Klang.